I managed to get ahold of the gripping O.J. arrest report before almost everyone else and cranked a piece for the New York Times' website late last night. Trouble is, the Times had a weird problem with their Web site and replaced my story with another one by accident earlier today. So for the moment you can't read it. Weird. Meanwhile, looks like I got punk'd. As you probably know, OJ got sprung on $125,000 bail. That, I hope, is the end of the matter for the moment. My piece on that is here. Outside the downtown Las Vegas courthouse, the carnival was in full force, with a man in a chicken costume holding up a sign that read “Not This Time O.J.” next to a man with one that read “O.J. O.J. He Was Set Up.” A man wearing a T-shirt with Mr. Simpson’s face on it and a hat that read “I love famous people” stood next to Mr. Galanter, Mr. Simpson’s lawyer, echoing many of Mr. Galanter’s statements and trying to get Mr. Galanter to give him a high-five in the middle of the news conference. At one point, his cellphone rang. They're removing that from the print edition version that'll run tomorrow, at least. But since I so frequently mock other journalists when they seem boneheaded, I figured I'd show that I, too, can work too fast and not be careful enough from time to time. Oh well. This is fun. Enjoy. Wouldn't want to be them. * A few minutes ago, the New York Times' blog posted my latest scoop on O.J. Check it out here. * Here's my piece from today's newspaper, the first time it's been confirmed that TMZ.com paid for the audio that's supposed to be of the alleged robbery. We'll discuss much more on "The Strip" tonight. Join us live as we record it and in the chat at LVRocks.Com at 7:05 p.m. PT. Plus, we'll have our killer chat with Steve Wynn. Oh, wait. Killer's not a really good word to use when O.J. 's around, is it? 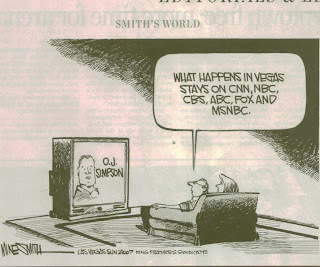 Exhibit A, above, is the worst because it comes from usually brilliant Las Vegas Sun cartoonist Mike Smith, whose comics get picked up by newspapers around the nation and are often reprinted in Newsweek. He's clever and smart and this panel was totally a phone-in if there ever was one. We expect better from Mike, especially since he's Vegas-based and must be as sick of this as we are. * This headline from Cinema Blend. * E! Online writer Marcus Errico, who thought it profound to open his Monday piece with: "O.J. Simpson's learning the hard way that what happens in Vegas, stays in Vegas. Or more specifically, Vegas jails." * Long Beach Post-Telegram writer Tony Castro in SoCal: "Betraying the advertising motto 'What happens in Vegas stays in Vegas,' O.J. Simpson's recent arrest in Sin City has thrust the former football star into the international spotlight again amid withering speculation about the psychological health of the once-accused killer." * Sun-Herald columnist Jim Mashek in Mississippi couldn't think of another way out of his column, so he concluded: "Goes to show what happens in Vegas can make you stay in Vegas." O.J. himself thought the phrase was inventive, too. Then again, he also seemed amused by the bloody deaths of his ex-wife and her friend. Simpson apparently told a fellow attendee at that wedding he went to the night after the alleged robbery, "What happens in Vegas is supposed to stay in Vegas" or some such construction. (Various papers have reported it differently.) Maybe if he beats the armed robbery rap, we can bring him up on charges for this! Finally, not to be completely negative, I'm going to cop to just one use that was even vaguely inventive. 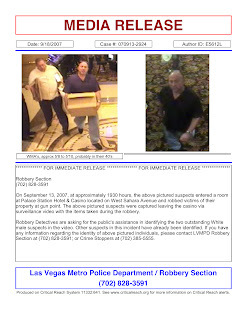 AOL's Vegas Pop Blog's "Dry Heat" dude, who does his job anonymously for no apparent reason, nonetheless did invoke WHHSH -- although he went with WHiV, which is not the slogan -- in directing Simpson to the LVCVA's Vegas Alibi Kit. Cute. Bearable, even. * Why "Le Reve" is making more money than "Spamalot"
Join us at LVRocks.Com for the live show and an even livelier chat. Or be that way and wait till Thursday for the podcast. We love you in either case. I just chatted with Fred Goldman for 10 mins for The New York Times on the OJ arrest. It's really good stuff. Take a listen here or right-click here to download it. My piece on NYTimes.Com on what's happened so far today is here.